Yoplait Light: The “Healthy” Choice? However, this simply is not the case! I found an interesting example to use to prove my point that fat-free and sugar-free are absolutely not healthy choices! Let’s break-down the unhealthy ingredients. Yoplait Light: And this is the “healthy” option? Modified corn starch: GMO! Thanks Monsanto! 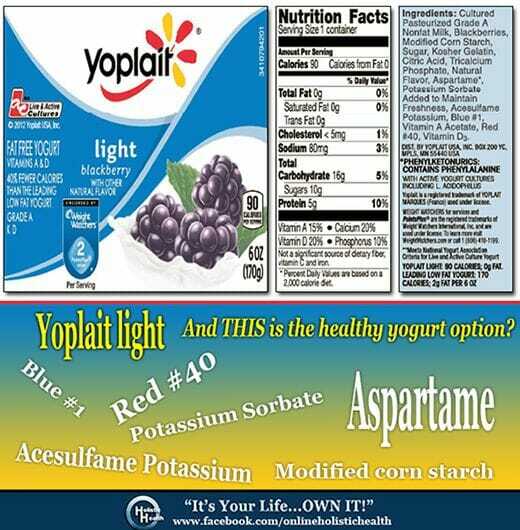 Aspartame: Did you know your “healthy” yogurt had this poison in it? Potassium Sorbate: This is a food additive that is meant to lengthen the life of the product. However, though many believe it to be safe…there are some scientists who believe overexposure can be harmful. Personally, I don’t understand the need to lengthen the life of yogurt! First of all, it’s called a refrigerator and as far as I know…putting food in one lengthens the lifespan of food! Second, if you run out of food…just go to the store! Acesulfame Potassium: I bet many of you didn’t know about this one. It’s an artificial sweetener linked to breast tumors and disrupting metabolism. Blue #1: Ah the food dyes! Here we go again! Known health effects: causes low blood pressure, asthma, hives, and may bring on allergic reactions. BANNED in Europe. Red #40: This food dye is particularly bad. Known health effects: causes hyperactivity, cancer and may bring on allergic reactions. BANNED in Europe. Now compare those ingredients to two other Yoplait products. Keep in mind that all three products are the same flavor; Blackberry. 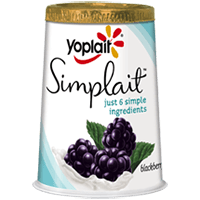 And with Yoplait Simplait, basically the same ingredients as the original, but the list gets a bit smaller due to the lack of the added synthetic vitamins. However no beet juice in this one…but there is lemon juice. 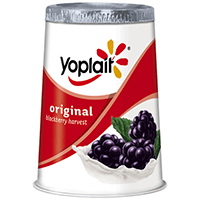 Though I am an avid organic advocate, and firmly believe that should be the ONLY choice, out of these three choices…it appears that Yoplait Simplait would be the best, followed by the original. Even though you are still ingesting milk from non-organically raised cows, non-organic blackberries, and GM corn…at least you aren’t ingesting the flat-out poison of aspartame, the food dyes, and the other added chemical preservatives! And if it’s about eating a few extra calories vs ingesting dangerous poisons of a low-calorie meal…I implore you to re-evaluate! ‹ The Truth About The Sun, Sunscreens and Skin Cancer	› Are Nitrites Dangerous?